A table of contents (TOC) is a common way for end users to find specific information in online and print output. Creating and editing a table of contents file in Flare can be very easy to do for both online and print output. You can drag topics from the Content Explorer to the TOC Editor. You can also manually add TOC books and items, and then link them to other files. The links usually point to topics, but for online outputs they can also point to external files, other Help systems, and movies. You put all of these books and items in a structure that you think would be useful for the individual. In online output, end users browse through a TOC to find information. And in HTML5 Side and Top Navigation output, the TOC items become links in menus. You have the option to customize your TOCs in lots of ways, getting as fancy as you want. However, there are some things you should know. Most importantly, you need to understand that the TOC files you see in the Project Organizer work differently for online output than they do for print-based output. 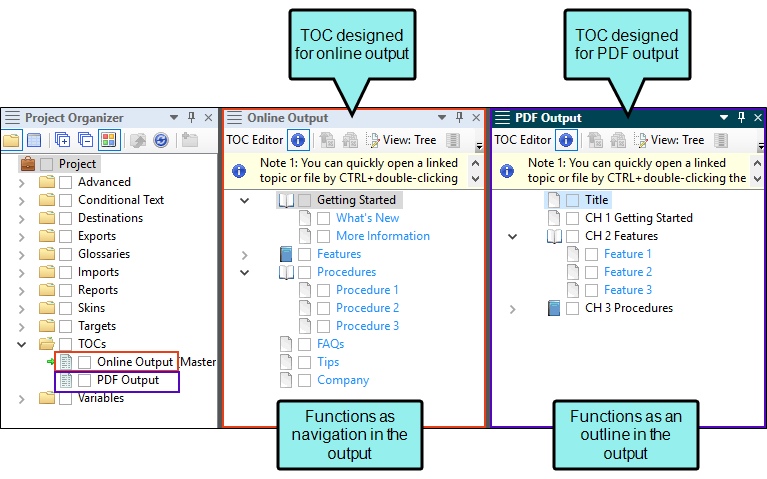 For online outputs, TOC files are exactly as their name suggests; they are files that create TOCs or menus in the output. But for print-based outputs, that same TOC file functions more like an outline. The element that actually generates a TOC in print-based output is called a "proxy," which is inserted into a topic. You can manually create that proxy yourself, or you can select an option in the Advanced tab of the Target Editor and let Flare do it all for you. There are pros and cons for both methods. You can include as many TOC files in your project as you want. Each TOC might be used for a different target, or you can use a single TOC file for multiple targets, especially if you use conditions on the TOC entries. You also have the option of linking TOCs together so that they appear seamless in the final output that your end users see. Each TOC is an XML file with an .fltoc file extension. These TOC files are separate from the main project (FLPRJ) file. This means that, not only can you have multiple TOCs in one project, you can also have multiple authors working on different TOCs for that same project. Following are the primary steps for including a TOC in your project. Add/Open TOC If you do not want to use the initial TOC often provided by one of Flare's factory templates, you can add one. You can open an existing TOC from the Project Organizer whenever you need to work on it. See Adding a TOC File and Opening a TOC. Create TOC You can create a TOC manually or automatically, adding books and links to topics or other files. See Creating a TOC. Edit TOC Entries After you create a table of contents, you can edit the individual entries in many ways. This includes linking entries to other files, setting titles automatically, and applying condition tags. See Editing TOCs. Enable TOC After creating the TOC, you need to enable the TOC in the skin you want to use for the target (for online output). This applies to all types of skins, except for HTML5 Side and Top Navigation skins. See Enabling TOCs in Skins. Associate Skin with Target Now that the TOC is enabled in the skin, you need to associate that skin with the target you are building (for online output). See Associating Skins with Targets. (Optional) Associate Master TOC with a Project or Target In most situations, you will have one TOC that you use for a particular output (target). In that case, you simply associate the appropriate TOC with the target. If you have multiple TOCs that you want to include in the same project or output target, the TOC that you associate with the project or target serves as the "master" TOC. In your master TOC, you have the option of creating links to the other TOC that you want to include in the output. If you do not select a TOC, Flare will use the first one in the project (if there is more than one). If you have specified a master TOC at the project level and another at a target level, the TOC at the target will take precedence. See Associating a Master TOC with a Project and Associating a Master TOC with a Target. For print-based output, the following additional steps may necessary when working with an outline TOC. Include Print Topics in Outline TOC You need to make sure that all of the topics to be included in your printed output (those that are only for printed output, as well as those that are for printed and online output) are added to an "outline TOC." See Adding Print Topics to an Outline TOC. (Optional) Specify Chapter Breaks with TOC If you are creating print-based output with page layouts, you may want to complete this task. After you create a page layout and configure its frames and settings as necessary, you need to associate the page layout with the appropriate content. In most cases, you will probably want to associate different page layouts with various entries in your outline TOC (so that different page layouts can be used for different parts or chapters in a manual)—see Specifying Chapter and Page Layout Breaks. Otherwise, you would associate a single "master" page layout with an entire target or project; in that case, the same page layout will be applied to all topics in that target or project. You can associate a page layout with an outline TOC entry with or without creating a chapter break at the same time. (Optional) Specify Section Breaks with TOC If you are creating Word output with master pages (or if you want to use "section" autonumbers), you may want to complete this task. After you create a master page for print output and configure it as necessary, you need to associate the master page with the appropriate content. In many cases, you will probably want to associate multiple master pages with various entries in your outline TOC (so that different master pages can be used for different parts or "chapters" in a manual). Otherwise, you would associate a single master page with an entire target; in that case, the same page layout will be applied to all topics in that target. Whenever you associate a master page with a TOC entry, you must first create a section break in order to do so. See Specifying Section Breaks and Master Pages. You can merge your project with others, connecting a TOC in one project with those in another project. This can be done in a few different ways, depending on your output types. See Merging Projects. You can also link multiple TOCs together. From the perspective of the end user, it will be seamless in the final output, appearing as just one TOC. See Linking TOC Entries. You can stitch existing PDFs into your output by adding links to them in a table of contents (TOC). This is supported in PDF output and all of the online targets. Note: You can use the built-in analysis tool and reports to find broken links. See Viewing Broken Links and Reports.